This term Bishop Challoner Sixth form part-took in an informative session known as MyBank. As part of this interactive activity, Sixth Formers were given the opportunity to understand the intricacies of university life and had what may have previously been limited knowledge refined by a university expert. This session involved student planning, budgeting and financial advice as well as general information about the lead up to university as well as how one can be prepared whilst experiencing life as a university student. In addition to this, Bishop Challoner has one again been involved in the raising of awareness and charitable thinking. As part of the Lenten journey, the Sixth Form in particular are focusing on educating ourselves on the topic of human trafficking occurring in the United Kingdom today. This Easter, as Jesus made the ultimate sacrifice for humanity, we too embark on a sacrificial journey of little, but significant, contributions to society and it’s battle for increased safety today. Activities of this nature are not taken for granted in the Bishop community and our federation strives to better society and its students in any way it can. Another term has passed, and once again there is an abundance of success stories for the school and its wider community to celebrate and be proud of. After the Christmas break all years once again regained focus on the task in hand, with coursework deadlines due and the exam period soon approaching. However there has also been large amounts of extracurricular activities such as bake sales and non-school uniform days, both aiming to raise money for charity; the Sixth Form even found time for a Teachers vs Students football match at Stepney Green. The 25th March saw the Duke of Edinburgh awards ceremony hosted at York Hall with a multitude of students, ranging from year 10 to 13, achieving Duke of Edinburgh bronze and silver awards. Also, this term was the election day for the young mayor of Tower Hamlets and Bishop Challoner had two candidates in the running, after all votes had been counted our very own Vivian had managed to secure the position of Deputy Young Mayor with over 1000 votes! 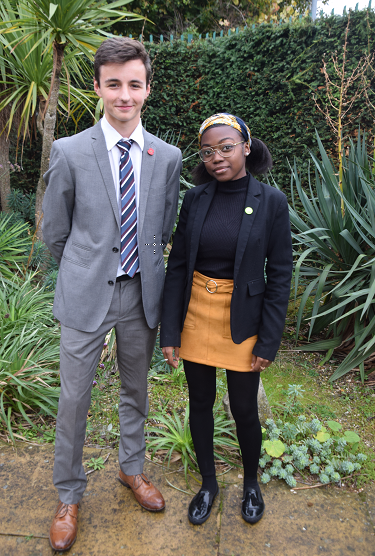 And the successes do not stop there, January brought the much-awaited Cambridge and Oxford University offers day, with two of our Sixth Form students, Hakimul and Sophie, receiving conditional offers. The school community now, as the Lenten period approaches its climax, prepares itself for the Easter Holidays and the celebration of the resurrection of Jesus Christ.